Where do writers go to recharge, relax, read…and get going on the next novel? World-renowned mystery author Elizabeth George and bestselling novelist Susan Wiggs tackled this topic, and the solution might surprise you. Now Ms. George and Ms. Wiggs have come up with a way to take the concept to the next level– by connecting with readers on a Caribbean cruise. In March, the sloppy tail-end of winter, the authors will be hosting a book club at sea. According to the authors and the event organizers, this cruise really is something different. The cruise line is Silver Sea, which means every room is a suite, and every suite comes with its own butler. There’s an open bar, and all-inclusive really means all-inclusive–drinks, wifi, tips, special excursions and private events with the authors. Each reader who books through Vacations By Design will receive a special edition of the authors’ latest novels to read and discuss with fellow travelers. The scott or phone 800-828-4813 extension 1003. I’m on sale this week! The digital edition of FAMILY TREE is just $2.99, ten bucks off the regular price. Snuggle up with your favorite e-reader. 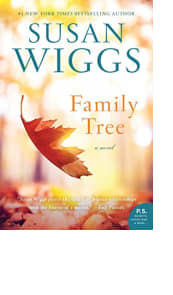 “This is Susan Wiggs at her best” (Debbie Macomber). When Annie Harlow wakes from a yearlong coma, she returns to her family’s home in Vermont — where she must solve an old mystery with the help of her grandmother’s cookbook. From a #1 New York Times bestselling author!